At Quantum Neuromonitoring, we are raising the standard of care in neurodiagnostics through state-of-the-art intraoperative neurophysiological monitoring (IONM) provided by highly trained and qualified personnel. IONM plays an important role in reducing the risk of injury to the nervous system during head, neck and back surgeries, thus optimizing the potential for successful surgical outcomes. Our unique approach to this rapidly growing subspecialty ensures that each Quantum Neuromonitoring-trained neurotechnologist (NT) is a team member in the operating room and practices the most comprehensive, multi-modality surgical monitoring available. Our NTs typically apply 30 to 50 recording and stimulating electrodes to the patient, and provides a virtual nerve “roadmap” that is used to monitor stimulation and conduction activities. This technique allows the surgeon, supervising physician and NT to read, interpret and communicate data relative to the nervous system’s reactions during the procedure, and provides up-to-the-millisecond responses. Extensively trained board-certified NTs who integrate themselves proactively into the surgical arena. Highest level of services within industry standards. Advanced techniques and innovative applications of existing biomedical technology. The use of pulse oximetry — Quantum Neuromonitoring is the first IONM company to introduce and use this technology with intraoperative monitoring in the surgical environment. Real-time remote monitoring of the IONM procedure by trained physicians licensed in the United States. Patient conferences as requested, ensuring patient comfort and understanding. Quantum Neuromonitoring recognized the need to better- train medical professionals who provide IONM services in the OR (operating room). The quality of IONM fo r spinal and cranial surgeries varies dramatically from one provider to another, covering the spectrum from maximal to minimal standards. 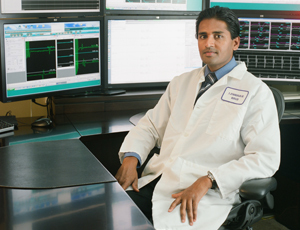 Our neurotechnologists (NTs) are board-certified in neurophysiological monitoring and includes MDs, PhDs and END/EEG technologists. Our highly-specialized staff provides high-quality, comprehensive IONM services and is uniquely positioned to perform optimal service as requirements become more stringent in this industry. Physicians interested in having surgical monitoring available for their patients need access to a qualified technical staff. In response to the critical need for well-trained monitoring personnel, Quantum Neuromonitoring has developed a comprehensive program to train and prepare NTs to become highly skilled in using IONM. An individual’s current level of medical education and experience is used to determine the additional training required for him or her to pursue a career in IONM. For example, someone with a background in electrophysiology might need additional knowledge of surgical procedures, image interpretation and surgical instruments. An operating room nurse (CNOR) would benefit primarily from training in electrophysiology and its application to surgical procedures. Knowledge of electrophysiology, while important, is only part of the equation. Quantum Neuromonitoring NTs receive extensive training in operating room and surgical protocols, anatomy and physiology, and the practical applications of IONM. We have found that NTs who demonstrate proficiency in these areas will provide the most comprehensive intraoperative monitoring available, ensuring the highest level of care. Quantum Neuromonitoring protocols require comprehensive multi-modality monitoring of numerous neural structures from start to closure in the surgical procedure. The NT must be able to identify all wave forms and problem solve appropriately. When neurophysiological responses fall outside defined limits, proper problem solving enables each NT to determine whether the cause is surgical, is related to anesthesia, or is of another origin. The OR can be a hostile environment for those with minimal IONM experience. Surgeons, surgical assists, nurses, anesthesiologists, and other personnel perform a variety of tasks during setup and throughout the surgery. The NT must be aware of each team member’s function and know how to work with each individual. Quantum Neuromonitoring NTs follow the Association of Operating Room Nurses (AORN) Standards, Recommendations, Practices, and Guidelines. Sterile field contamination presents a common problem in the OR. Contamination of the sterile field can delay a surgery significantly. Additionally, delays increase the danger to the patient by increasing the time under anesthesia and elevate the overall cost of the procedure. An experienced NT with knowledge of sterile technique will minimize the possibility of sterile field contamination. Knowledge of surgical pathology and anatomy enables the NT to properly prepare the patient for monitoring before surgery begins. Once the procedure is underway, it is difficult and sometimes impossible to add additional electrodes that may be needed to monitor neural structures not identified prior to the start of the surgery. Proper electrode placement is paramount to successful monitoring, and a cornerstone of our training protocol. Basic understanding of X-ray, CT or MRI images helps the NT understand the surgical pathology and anatomy for electrode placement during patient preparation. Knowledge of surgical pathology enables the NT to converse intelligently with the surgeon as to the surgical plan and anticipate possible deviations. This knowledge allows the NT to prepare in advance for any possible changes to the required stimulation points. Thorough knowledge of the surgical procedure enables the NT to monitor the correct neural structure with the appropriate modality at any given time. All too often, when an NT does not possess this knowledge, a negative outcome can occur because the NT institutes the inappropriate modality or monitors the incorrect neural structure. Knowledge of how anesthetic variations affect the quality of recordings is critical. The successful NT must comprehend a vast amount of information about this topic, which constitutes an entire class in itself. Surgeons generally do not narrate what they are doing while operating. The NT must learn about surgical instruments so that he or she will be aware of what the surgeon is doing by observing the instruments in use. The well-trained NT will thoroughly understand how an internal fixation device is used. This knowledge enables an NT to properly prepare and monitor a specific structure with the appropriate modality. There are numerous modalities specific to each surgical procedure. The NT must be capable of incorporating the appropriate modality at all times. The well-trained NT must set up his or her station proximate to both the surgeon and anesthesiologist to observe the surgical instruments and anesthetic concentrations being used. Positioning the station away from electrical interference is also critical. Knowing what modality to incorporate at any given time enhances the NT’s ability to proactively identify a neurological deficit before it becomes detrimental to the patient and advise the surgeon accordingly. In addition to having all the necessary knowledge, the NT must be able to communicate with the surgeon and anesthesiologist in an informative, timely manner. While communicating during surgery would appear to be an easy task, this skill becomes absolutely necessary when tension in the operating room reaches its peak.